So, my man is obsessed with the Game of Thrones. Most guys are, naturally. They are thrilled with the violence scenes, the powerful lines and basically, everything about this book - TV series. Oh, and, coming soon, video game. Of course. Being a Lord of the Rings fan, I just cannot persuade myself to actually like the Game of Thrones. Not enough to make a piece of jewelry, at least. It would just be 'going with the flow' for me. You know, not an honest thing to do. I made a Game of Thrones bookmark for my guy, because he asked nicely (! ), and that's as far as I want to get. But there's nothing stopping me or you from admiring other people's work on Etsy, that is inspired by the Game of Thrones. I think their work is brilliant! Fantastic work, people! Keep it up! Unpatiently waiting for april and new series - as does your man, Im sure! Thank you for your comments, girls! Marta, indeed that is a BRILLIANT photoshoot :) Anastasia, I love your blog -I'm definitely following! 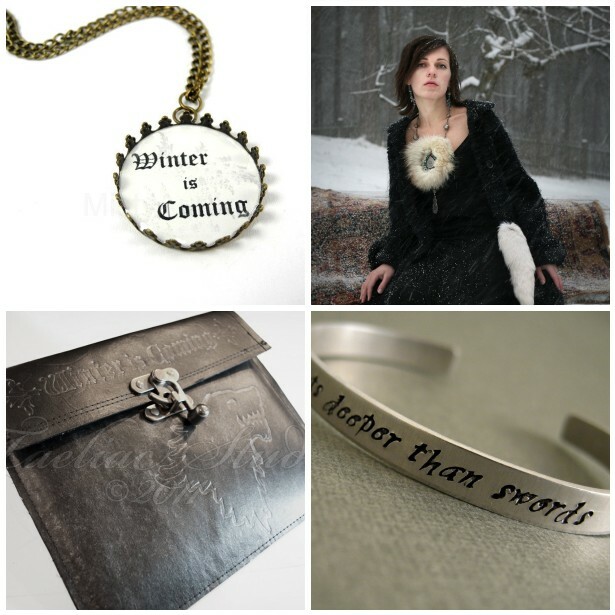 OMG that necklace by the famed Marta of Magpiesshop is stunning! not to mention the incredible photograph. I adore the books and must say that they do a great job on the TV series in regards to following the story. Being a LOTR fan should not stop you reading these books. You can't compare the two. Anyway, I think you're right about the fact that I can steal the books at some point and get down to reading them. I suppose at least that would be enjoyable. I love your picks especially that leather ipad case, fantastic! I adore it though I have to recognise that it's not comparable to "Lord of the rings". The finds you've posted inspired by "Game of Thrones" are amazing.